We start in Moalboal at 9am (free resort pick up) with a briefing followed by a 1 hour 15 minutes car drive we reach the canyon. Now we follow the river always downstream. There are 3 rappellings (max 25m) and also jumps. Our team will make sure you are always safe and you will learn how easy it is to rappel. There area also optional jumps from 2 to 6m height. After about 2 to 3 hours we reach the final destination: Hot springs! We will be back in Moalboal at around 3 to 4pm. Cyan works highly standardized from booking to guiding. Top quality for each guest everytime. No excuses. No shortcuts. 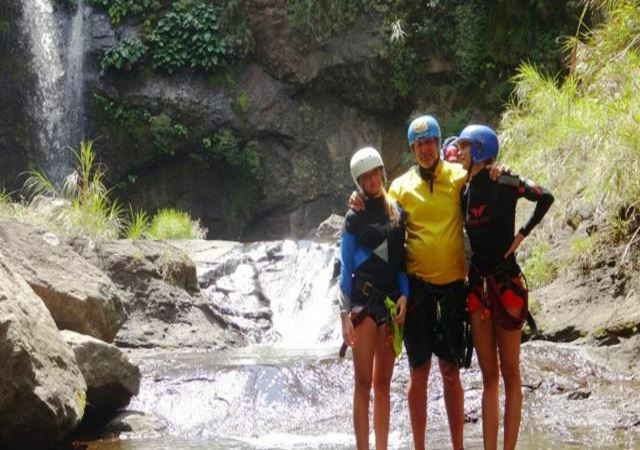 Life Jacket, special non slip canyoning shoes, full wetsuit and Petzl safety helmets!